The world’s media (well, some of it at least) is eagerly anticipating the release of tens of thousands of emails sent by Sarah Palin while she was governor of Alaska. The emails, which date from her inauguration as governor in 2006 through to her selection as John McCain’s running mate for the 2008 Republican presidential campaign, will be released at 6pm today. The release looks set to spark a race between news organisations to dig out stories (or, let’s face it, plain old gossip). In an affront to everything modern and digital, Palin’s office will release the 24,199 emails in printed form, in six boxes. That means, of course, that journalists will have to visit the courthouse in Juneau, Alaska to collect the documents and trawl through them on paper or scan them in. The major US nationals will be on the courthouse steps at the appointed time of course. But it looks like there will be at least one UK newspaper represented – with the Guardian’s “crack correspondents” Ewen MacAskill and Ed Pilkington due to be “holed up in a Juneau hotel room combing through thousands of Palin emails as fast as they can read”. The Guardian will then follow its MPs expenses app model by putting the trove of documents online and asking its readers to help analyse them. The release comes just ahead of Palin’s visit to the UK and follows her recent bus tour of the east coast of the US. She is currently refusing to be drawn on whether she intends to run for president, and it remains to be seen whether the release of these emails will shed some light on a potential bid, derail it, or reveal no new interesting information at all. Palin’s email was hacked back in 2008, with Anonymous, the group behind pro-WikiLeaks attacks on Mastercard and Amazon, thought to be responsible. This entry was posted in Investigative journalism, Newspapers, Politics, Press freedom and ethics and tagged alaska, America, ed pilkington, Politics, Sarah Palin, The Guardian on June 10, 2011 by Joel Gunter. Paul Bradshaw’s Online Journalism Blog has an interesting look at user-generated content and comment moderation, and the stories they can produce. Bradshaw looks specifically at Sarah Palin’s Facebook page, which has been subject to strict moderation in the wake of the assassination attempt on Arizona congresswoman Gabrielle Giffords. He points out that the decisions to remove certain comments and let others stand can be seen as representative of the page owner’s stance and could potentially give rise to a story. Bradshaw also warns that trawling through comment threads on political pages is not the same as treading the streets. What you see there is not unadulterated content, it is closer to carefully edited campaign material. Full post on the Online Journalism Blog at this link. Lost Remote has a post on another media issue to emerge from the Giffords shooting: the spreading of inaccurate claims on Twitter that Giffords had died, and subsequent removal of tweets by news organisations. Full post on Lost Remote at this link. This entry was posted in Online Journalism, Politics, Press freedom and ethics, Social media and blogging and tagged comments, Facebook, gabrielle giffords, Lost Remote, moderations, Paul Bradshaw, Sarah Palin, Twitter, ugc, user-generated content on January 10, 2011 by Joel Gunter. So was it the ‘Blogs Wot Won It’ for Barack? So it doesn’t need saying that US Election 2008 took place in a very different media climate from the one experienced in 2004: just take a look at CNN à la 2004, and CNN right now. It’s hard to actually think back and remember that four years ago the focus for many of this year’s online followers was still on the TV screen. Last night we followed live-streams. We Twittered. We traced maps. We enjoyed striking homepage designs as the results came in. This was the year for multimedia to really come into its own. The public outside the electoral college had a chance to participate from afar. 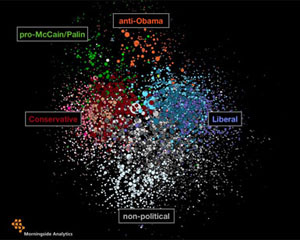 Many bloggers might not have had a vote, but they could be influential: by spreading round a Sarah Palin debate flow-chart, casting a vote on a remote voting map, or putting a supporting button onto their sites (the online version of the rosette). And what about the negative effect for McCain? You may have your reservations about this story, but Fox News reported in July how McCain supporters could have been hijacked through spam reports to Google Blogger, prompting a Republican blogger move over to WordPress. Renee Feltz, over at the Columbia Journalism Review, looks in detail at whether McCain was ‘blogged down in the past’ with ‘top-down internet tactics’, which left him unable to keep up with Obama’s social networking strategy. Their isolation shows that they are not well-connected to political blogs with the longer histories, a point which John Kelly, Morningside’s chief scientist and an affiliate of the Berkman Center, explains on the CJR post. Please do add your own Obama bloggin’ thoughts here. Was is the blogs, and which ones, which gave Obama strength? And what should we expect on the multimedia horizon for 2012? This entry was posted in Journalism, Mobile, Multimedia, Online Journalism and tagged American Idol, Barack Obama, Berkman Center, chief scientist, CNN, Columbia Journalism Review, google, internet campaign, internet meet-ups, internet supporters, internet tactics, John Kelly, John McCain, media climate, Mercury News, obama blog, obama blogging, online blog cluster, online followers, online rosette, online version, Renee Feltz, Republican Party, Sarah Palin, social networking strategy, The Columbia Journalism Review, the CJR post, the World Series, us election, USD on November 5, 2008 by Judith Townend. On Wednesday, 20-year-old David Kernell pleaded not guilty to hacking the e-mail account of Republican vice presidential candidate Sarah Palin. This entry was posted in Editors' pick and tagged David Kernell, Politics, presidential candidate, prison On Wednesday, Sarah Palin, USA on October 9, 2008 by Laura Oliver. After hackers broke into Sarah Palin’s personal email account, the US Secret Service contacted Associated Press and asked for copies of the leaked e-mails, which circulated widely on the internet. The news agency did not comply. This entry was posted in Editors' pick and tagged AP, Associated Press, Sarah Palin on September 18, 2008 by Laura Oliver. Hundreds of online commentators, entrepreneurs, and Palin imitators are trying to fill in the gaps in the online information available on Sarah Palin. This entry was posted in Editors' pick, Online Journalism and tagged blogs, online commentators, online information, Politics, Sarah Palin, USA on September 5, 2008 by Laura Oliver. 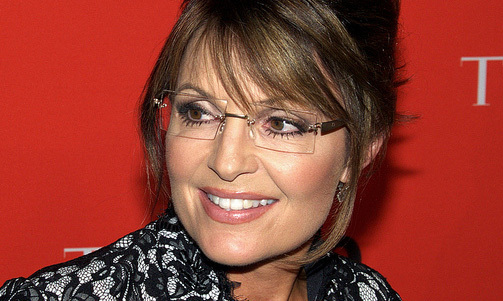 Reports on the Daily Kos that John McCain’s deputy Sarah Palin was actually the grandmother and not the mother of her young son eventually exposed the fact that Palin’s daughter was pregnant. But should such news be made public in this way? And are political parties having to react to too many ‘reports’ from the blogs? This entry was posted in Editors' pick and tagged bloggers, blogging, blogs, deputy, John McCain, Sarah Palin, USA, Washington Post on September 2, 2008 by Laura Oliver.